On October 18, 2018, three families of members of the aid organisation “White Helmets”, which is active in Syria, were admitted to Germany. The admission’s legal basis is § 22 AufenthG. The families spent several days in the initial reception centre Friedland and participated in the orientation course offered there. After Friedland, the families were placed in three different federal states. In their municipalities, they receive a residence permit limited to up to three years from the relevant immigration authority. Several media informed in the past that a total of eight White Helmets and their families (47 persons total) will be admitted to Germany. The “White Helmets” is a relief organisation, whose volunteers have so far helped over 100.000 people who where injured and buried by collapsed buildings in the Syrian rebel areas. At the end of July 2018, a couple hundred White Helmets (422 members) were first evacuated to Israel and then to Jordan. 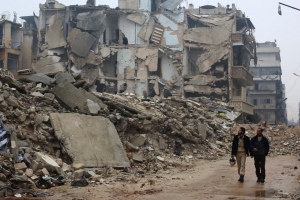 The reason for the evacuation was the threat of advancing government troops in southern Syria. In 2016, the White Helmets won the alternative Nobel prize. One year later, the Netflix documentary “The White Helmets” received an Oscar for best documentary short-movie.